This week has been crazy. Sometimes I feel like I'm running around like a chicken with my head cut off, and it always seems like I'm not making any progress. After a good stem cell collection with apheresis, Saoirse had Wednesday off, so we spent some time catching up with some friends. It's always nice when we can take a little bit of a relaxed day to do something nice for ourselves. I, of course, had doctors appointments in the morning, but managed to get through those without too much trouble (although I sometimes get frustrated with my oncologist because if she doesn't think the symptom is related to the chemo or the cancer, she sometimes glosses over it without any acknowledgment of whether or not I should do anything about it). Friday was the big day - Chemo day for me (second to last! ), and scan day for Saoirse. Mike took Saoirse to Boston and she did a great job with her scans. She made it through her MIBG with only a little bit of crying at the end (when they had to hold her head still), and she slept through her CT so they didn't have to sedate her! Mike was so proud of her. She is such a great little trooper. I had my chemo, and I used the time to catch up on some crocheting, and some "work" on fundraising and such. Recently I feel like I've been spending more time on the computer, updating this and that, than I have doing things with my family. Sometimes I feel like everything blurs together and I never get any clear family time. Still, it's hard to believe that I only have to go one more time. It's become such a routine. Imagine what I'm can to do with all this extra time on Fridays! Saturday was spent resting. These last few chemos have really knocked me down. I really have absolutely no extra energy, and chasing a now walking and adventurous baby around takes its toll very quickly. Luckily Mike and my family have been able to pick up some of my slack. The house is atrocious, and the porch is filled with random stuff, but we just have to overlook it. There are days when I think that if I could just get the house organized and put everything away, life would feel less chaotic, but I get one room done, and it isn't long before another room is a disaster (plus, I'm pretty sure that's not why my life feels chaotic right now). Someday everything will have a place and everything will be put away, but until then, we'll live with the piles of stuff and the seemingly endless, moving "office" that has taken over the house. Sunday - my day. Since we were originally scheduled to go into Children's for chemo on Monday (my actual birthday), we decided to do fun birthday things on Sunday. After a nice and restful morning, we went into Rockport to go swimming and to have dinner. We even tried a new restaurant (well, new to us, it's been there forever) which was really good - Ellen's Harborside. We took the baby in the water (I sealed her up with tegaderms) and she had a blast, but we got yelled at by her doctors, so I guess we won't be doing that again. (I understand the infection risk, but I promise, she was so sealed up not a drop got in!) I guess it's just wading for her from now on. Too bad it's so stinkin' hot! After all the whooplah, and business, we were all set to be admitted on Monday for Saoirse's chemo. 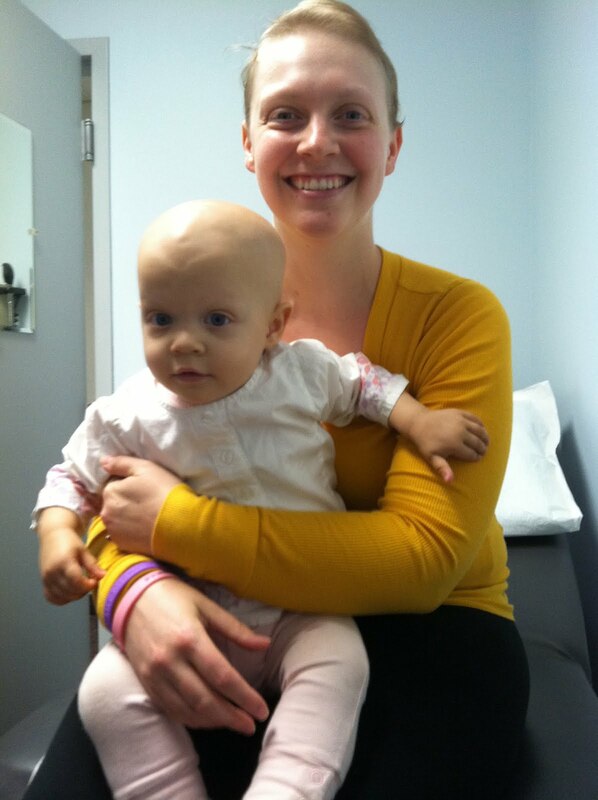 We went into Jimmy Fund for labs and her doctor's appointment, and then found out that not only was she not being admitted for chemo that day, but that she also had a bone marrow biopsy the next morning. Now I knew they were going to do the bone marrow biopsy, but I didn't realize they had to do it before the round of chemo, and when the schedule got changed, no one ever called us to tell us. Super frustrating, not because we went down for no reason (we would have had to go down either way), but because we lugged all sorts of stuff with us and parked in the children's garage a block away because we were sure we were going to be leaving from there. Ahh well; it meant that we got to come home and I got to have my birthday ice cream cake actually on my birthday! What a nice birthday surprise. We even got some play-with-the-neighbor-girls time in, and Saoirse always loves that (and so do they)! So now for the chemo and the never ending job of keeping a one-year-old entertained while she's attached to a pump and giant pole for 5 hours. I didn't want to sit down anyways; that would be boring. Bring it on! I got useful information from your blog, thanks for posting. India is one of the most lucrative medical tourism markets in the world. Driven by factors, such as government support through policies and initiatives, low cost, less waiting time, healthcare infrastructure, and rich cultural heritage, the country has witnessed a remarkable growth during the recent past. carpet repairs and stretching BothellCarpet Cleaning in Seattle, Bellevue & Surrounding Areas - Our carpet cleaning Seattle, WA experts provide the most professional carpet cleaning services Seattle can offer. Contact us today! spells and magick When we think or talk of witch, we are always reminded that it’s some kind of supernatural power which is imposed on an individual by learning some crafts of handling it. Salkantay Trek : We depart the city of Cusco at 5 am driving past the towns of Izcuchaca and Limatambo. Arriving at Mollepata (approx 8 am) we begin our hike up to the high part of town until reaching Cruz Pata where we will have lunch.